Postlandia: A Post Office? Yeah, We've Got That. A Post Office? Yeah, We've Got That. A new partnership between USPS and Staples Inc. offers a promising opportunity for the Postal Service to expand access to its services. 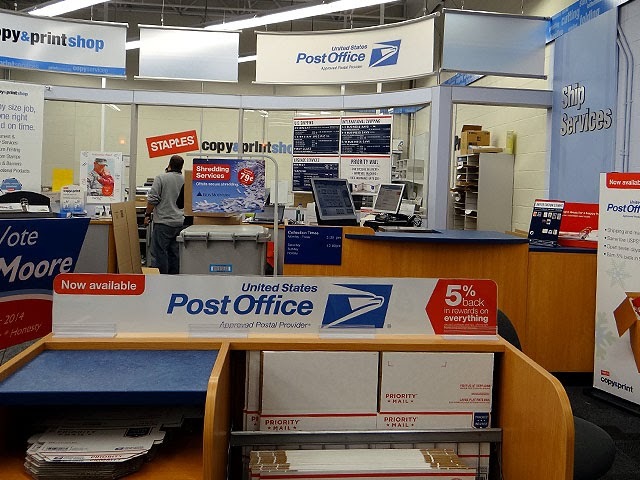 A recently announced pilot program, the first such agreement under what USPS terms its Retail Partner Expansion Program, calls for the opening of 82 Contract Postal Units (CPUs) in Staples stores. If successful the program could be expanded to the remainder of Staples's 1,500+ domestic locations, and partnerships between USPS and other large retailers may soon follow. Contract Postal Units involve postal counters that are placed in, and operated by the employees of, other businesses. The operations offer most postal retail products, and do so at standard USPS prices. The pilot's 82 locations are clustered in several markets: the San Francisco Bay area (with 29 CPUs); Atlanta (28 CPUs); Pittsburgh (16); San Diego (3); and Worcester, MA (6) -- near Staples's headquarters. The first CPUs opened mid-October, and as of November 15 all 82 are operational. The Postal Service provided Going Postal with a full list of all pilot locations and their respective opening dates. The list can be found at the end of this article. USPS and Staples held ribbon-cutting ceremonies in various markets to celebrate the pilot venture. At the CPU ribbon-cutting ceremony in Shrewsbury, MA, Staples District Manager Steve Lemieux -- whose father was a Postmaster -- predicted that the new program would be highly effective at serving its small business customers' needs. 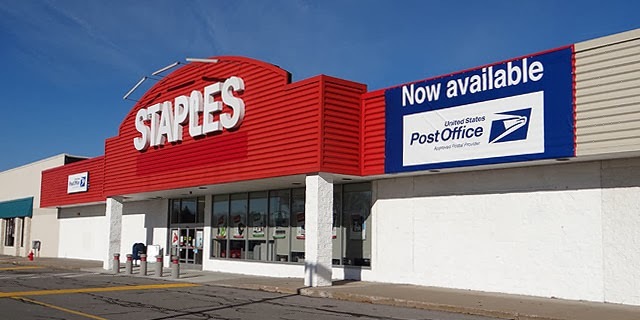 Mr. Lemieux stated that Staples is always looking to provide the "best value for its customers" and that the USPS counters would help the store "take care of their needs and get them back to their jobs." At the same event USPS's Greater Boston District Manager Charles Lynch declared that the Postal Service had "great expectations" for the project. USPS media releases declare that the program was designed to provide "convenience and options to customers." Reached via email, Postal Service spokeswoman Darleen Reid called the program "win-win for all parties: USPS, Staples, and our customers." The two organizations will initiate a joint television advertising campaign in the program's test markets beginning November 18. Going Postal has been informed that the program will also be supported with Direct Mail mailings to customers in these areas. The pilot program ends September 30, 2014, at which point the program will be evaluated and may be expanded or discontinued. In addition to its network of nearly 32,000 post offices, USPS manages about 3,500 CPUs, most of which are located in locally owned businesses such as pharmacies and gas stations. The Postal Service has previously attempted, though not succeeded with, large-scale Contract Postal Unit programs with national retailers: Sears, Hallmark and (before the chain was bought out by UPS) Mail Boxes Etc. The arrangement with Staples represents USPS's first CPU partnership with a national chain in nearly a decade. This program appears more likely to succeed than its predecessors; USPS's arrangement with Staples appears to be better conceived, better publicized, and better integrated with partner stores. The CPUs are staffed by Copy & Print Center personnel who have received training from USPS employees. These Contract Postal Units operations offer most, though not all, standard postal products. The operations, at least at their inception, are offering a variety of stamps including several issues of commemorative Forever and Global Forever stamps. They accept Priority, Priority Express, Standard Mail, and large first-class packages. Most additional services, including Certified Mail, are available. 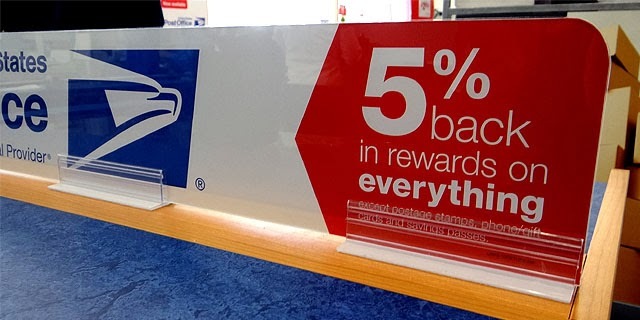 In a unique move among USPS partners, Staples will offer 5% Staples Rewards for the postage on packages paid for and shipped at its Contract Postal Unit locations. Thus, if one ships a $20 Priority Express Mail package and pays for the metered postage at Staples, one would receive $1 in Staples Rewards. "This is our killer app," declared one Staples staffer, suggesting that this aspect of the program would make customers' postal experience noticeably superior to that at other post offices. However, the Staples Rewards offer does not apply to stamps purchased at Staples CPUs. While the provisions of the Retail Partner Expansion Program have not been publicly disclosed, most individual Contract Postal Units earn a commission of 6% to 10% on postal services rendered. Thus, even if 5% of all package purchases were redeemed as Staples Rewards the company comes out well ahead. An initial media story -- a local Patch interpretation of USPS's Bay Area news release -- wrongly declared that USPS is paying rent to Staples as part of the pilot arrangement. Such a provision is not part of any standard Contract Postal Unit agreement, and Ms. Reid has confirmed that the precedent holds in USPS's contract with Staples. This is not the first service arrangement between USPS and Staples Inc. Staples stores have offered booklets of Forever stamps at its checkout counters for several years under as part of USPS's "Alternative Access" program. 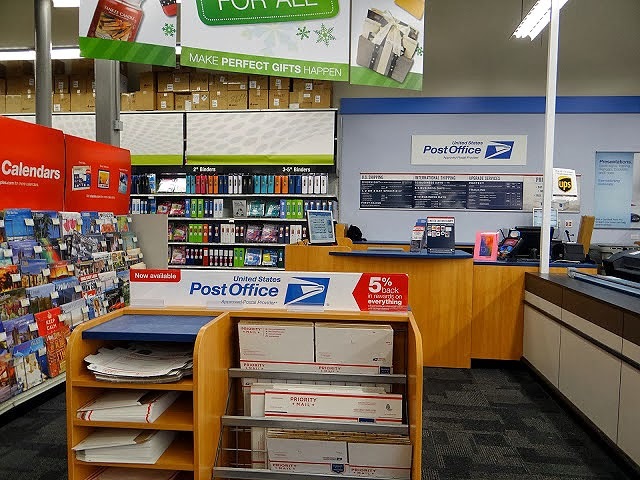 The Postal Service has similar arrangements with most large retailers, and Staples stores not impacted by the USPS pilot program continue to offer this modest service. 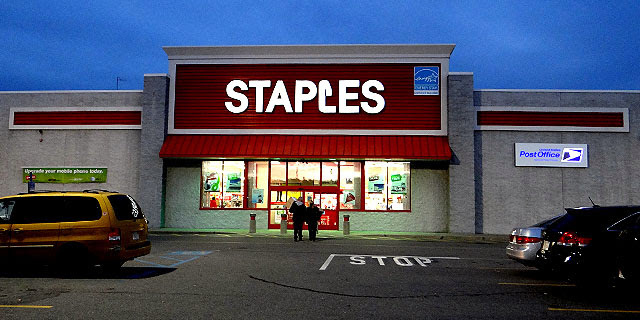 Prior to the pilot program, each Staples store maintained a full-service UPS shipping counter. These services are still offered at all non-pilot program stores. At the 82 CPU locations, UPS computers were disconnected and its services ceased to be offered the moment when Postal Service machines became functional. This step occurs toward the end of the one-to-two-day, four-hour training session that postal staff (including some from Postal Headquarters and other District retail personnel) conduct with Copy & Print Services staff. All Staples locations continue to serve as drop-off points for prepaid UPS parcels. Thus, UPS's arrangement with the 82 USPS pilot sites is similar to that of USPS with its "Village Post Offices," whose counters accept only domestic prepaid [primarily Priority Mail Flat-Rate] packages. 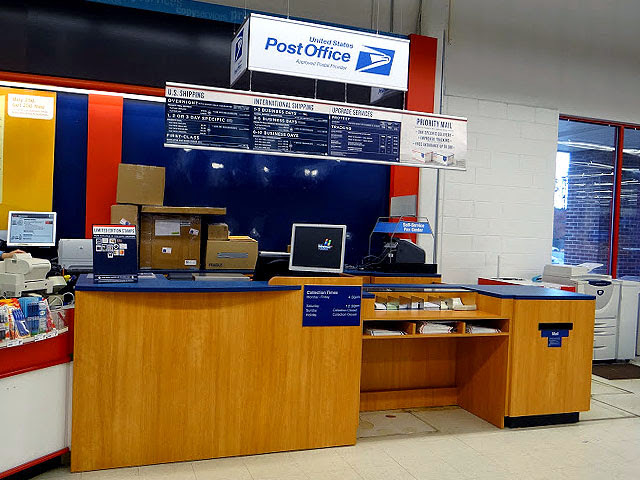 The CPUs operated by Staples are equipped with USPS's new, modern blue-atop-faux-wood counter arrangements that appear in many CPUs and in recently remodeled/relocated post offices. In addition to the primary retail counter, other counter units house Priority Mail Flat-Rate packaging and forms for services such as Certified Mail. 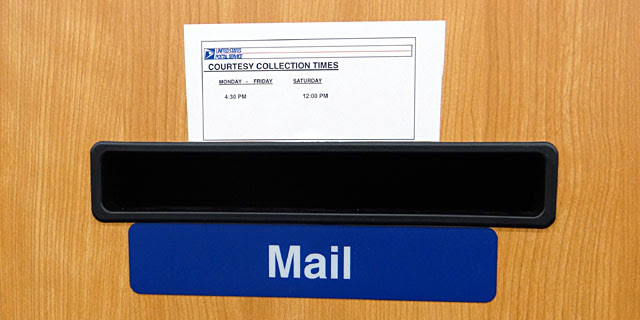 A courtesy letter collection box is located in one of the secondary counter units. It is subtle and, if not marked appropriately, could easily be mistaken for the slot for a garbage can. The Postal Service is looking to install blue collection boxes outside most (if not all) of its Staples CPU locations. The operations utilize a specially developed version of the Postal Service's Contract Access Retail System (CARS) -- a two-monitor, touch-screen arrangement that enables customers to view their transaction as it is processed by a CPU operator. A large Sonic Eagle sign has been installed on the façade of each Staples CPU location. The sign states "Approved Postal Provider" in place of Contract Postal Unit. The signs light up at night except where prohibited by local zoning ordinances. A recent Freedom of Information request revealed that a similar (though possibly smaller) backlit sign installed at a Village Post Office costs about $2,300. Beyond the pre-opening training seminar, local Postal Service managers are available to answer any Staples's staff questions regarding products, services, or technical computer issues. Postal staff appeared to be engaged with, and supportive of, their Staples counterparts. The American Postal Workers Union (APWU) has yet to comment on the pilot program. Save the Post Office (STPO) has detailed previous opposition to the CPU pilot program involving Sears stores in 1989. The APWU, which counts as members thousands of full-time post office window clerks, has frequently taken a negative stance on Contract Postal Units. CPUs are perceived as siphoning business from union-staffed post offices, which could result in reduced staffing at -- or the closure of -- nearby post offices. The STPO piece also discusses concerns that such CPU programs might provide a step toward USPS's outsourcing of more operations, which could ultimately result in the privatization of the Postal Service. Postmasters tasked with managing local Staples operations took a by-and-large positive view of the new outlets during informal discussions. When asked whether the proximity of a new Staples CPU in northeast Worcester might prompt the closure of the small retail post office in the shopping plaza across the street, a Postmaster replied that s/he can't imagine that being the case, especially because local low-income residents are heavy users of money orders (which are not provided at the counters at Staples). Another Postmaster suspected that while the Staples might usurp a bit of the revenue from his/her office, most of the nearby CPU's business would stem from customers who would have otherwise shipped their packages using other carriers. S/he expected that the result would be a "net positive" for the Postal Service. Two hours after one of the Massachusetts CPUs opened, a large rolling postal hamper was piled high with parcels. Staples staff informed me that the mailing was entered by a local business owner who'd always used the UPS counter at the store to ship his packages. Instead the Postal Service became the recipient of nearly $200 in revenue. The postal specialist who'd conducted the CPU training called the local post office to request an additional mail collection. Within ten minutes a local carrier had pulled in and rolled the mail hamper out of the Staples and to his truck. At least in central Massachusetts, the program was off to a promising start. Ho Hum, another Postal contract station, staffed by untrained employees, who will screw up mailings, leaving customers to go to a real Post Office to complain. This has been done before, remember the Sears snafu? The "training" that will be given will be by postal managers, not retail trainers, giving substandard training to begin with. As a matter of fact, the person that did the training for this operation, is a Retail Specialist. So next time you want to share your opinion,which is all it is, at least know the facts. The two trainers I "trailed" for a good part of the week were retail specialists from Postal Headquarters and a District in the Southern Area, respectively. I'm very thankful to everyone from USPS and Staples who allowed me to pepper him/her (on or off the record) with questions regarding everything from the minutiae of stamp distribution and collection box times to larger policy issues, some of which were only briefly touched upon here. Next we will be contracting out mail delivery to the pizza delivery chains. The Question is in place at these operations as at standard Post Offices. You are asked "Is there anything liquid, fragile, perishable or potentially hazardous ..."
Finally got to all six Worcester area ones myself. The staff were all helpful, but gave mixed reviews on the success of the CPU, after being open for a couple weeks. Meanwhile, the APWU issued their statement today. I mailed two prepaid USPS packages at Staples in Pittsburgh over two weeks ago and they have never arrived at their destination. This is making me think twice of using them again. Simple solution is to allow postal employee to work at these new post offices at staples. It would improve service quicker and It would create a better workingRelationship with postal employees. The USPS does not follow private employer policies, just as a private employer has discretion over their establishment. That's the whole CPU logistical arrangement that barely lets the CPU make profit. Let's take a hot button issue- weapons. Specifically firearms. You think Staples will ban customers with concealed carry just because there are Federal workers inside? I shop at Staples, but I'd rather have my real Post Office, with my real postal workers.